The cooler season is all about getting comfortable and to cozy up with a cup of hot cocoa and a good book. Wait, that is not all... It is also time for a new hairstyle that is so beautiful, timelessly chic and full of temptation that it instantly warms you up from the inside. Camille Albane has just the right prescription for the longer nights and shorter days. 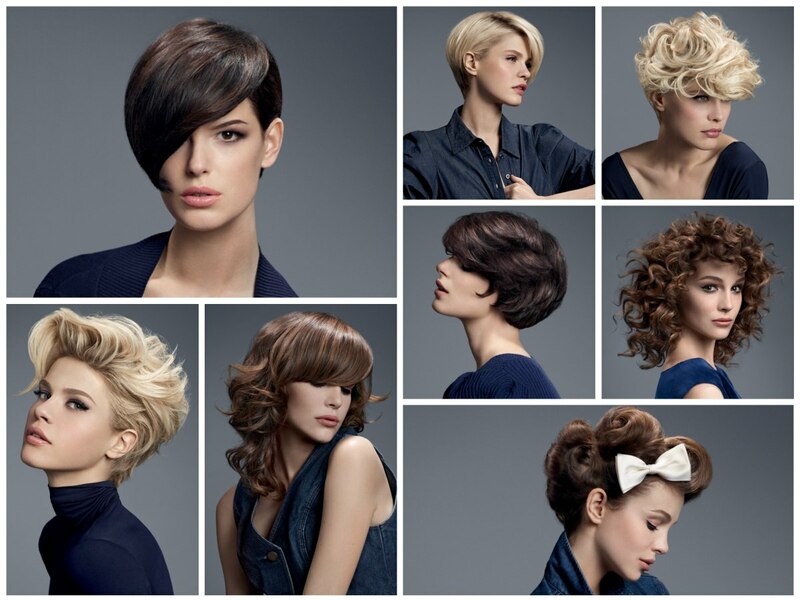 A stroll through past decades gave the inspiration for some of these gorgeous hairstyles. Feminine curls, beautiful curves, geometric shapes and dazzling expressions make the new season very inviting and we cannot wait to put those little bow-ties in our hair! The trend hair colors this fall and winter are very natural, at times the individual color is enhanced with transparent washes and highlights are used in very subtle and refined ways. Short haircuts with a lot of volume and even more movement were popular in the 90s but today they are even more beautiful. Camille Albane makes this style look effortless and very attractive. The secret is a slightly messy but determined styling. The layered hair was lifted for this great body and upward style. More length on top allows for the sculpted bangs and the sweeping lines will take you on a ride to winter wonderland. A great length to show off the latest trends in turtleneck sweaters but collared blouses are also a great match for this pixie hairstyle. The color is a warm beige blonde with slightly darker tones in the lower sections. 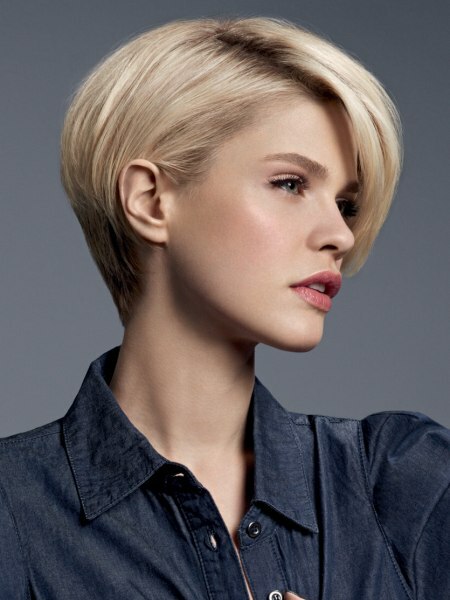 The curve of the long fringe repeats the shape of the rounded back and together all of the lines in this smooth, short haircut are pure harmony. Polished, neat and so very elegant in its simple, geometrical approach to beauty in hair, this look is timeless and just sublime. Asymmetry is one of the eye catching elements, the fine layering and graduation of the neck another. 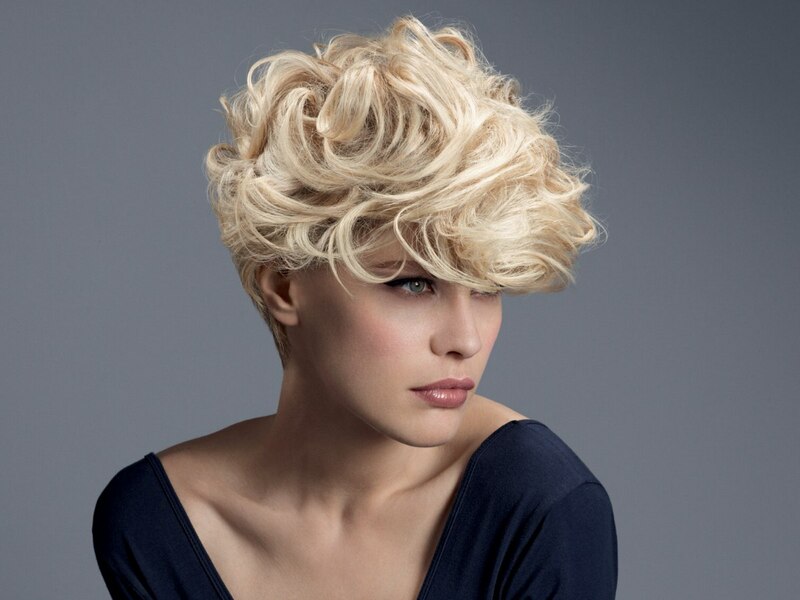 Bathed in the radiance of a luscious beige, vanilla blonde, this charming hairstyle is one of the season's highlights. A slightly detached and cool elegance can turn into a whirlwind of seduction with the same base cut and just a different styling. 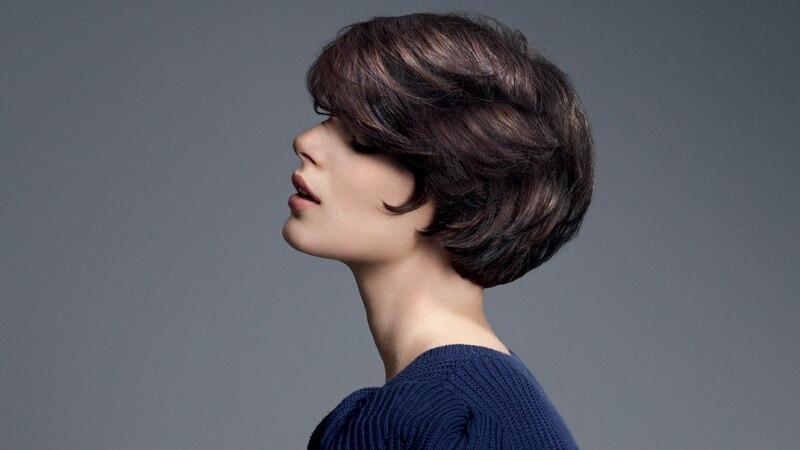 The longer top hair of this very short haircut has enough length to be turned into this bundle of alluring curls and wild waves that spill out over her head and into her face. Big rollers or a curling iron can take care of the curls, skilled hands can do the rest. 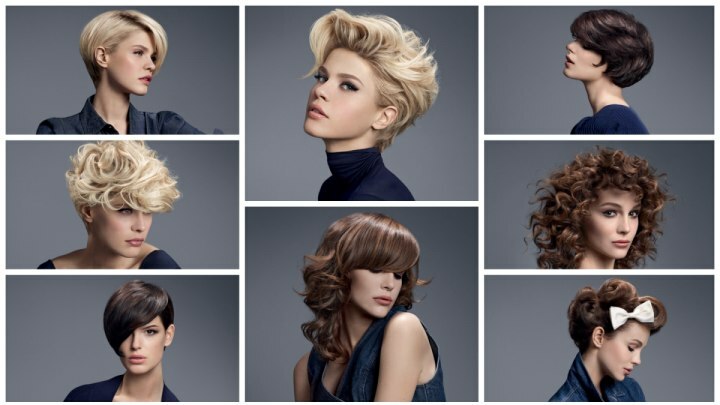 The curls and waves are deconstructed to varying degrees and gently tousled. In front the hair covers her forehead for a very sensual effect. Move over Blondie, here is a hot look in a sizzling brunette color. 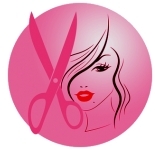 Her thick hair was cut cut in layers and in a round shape with long bangs and a full neck. This look is all about soft lines and captivating movement. The natural looking smooth curves follow the shape of her head and coyly curl into her face on the sides. 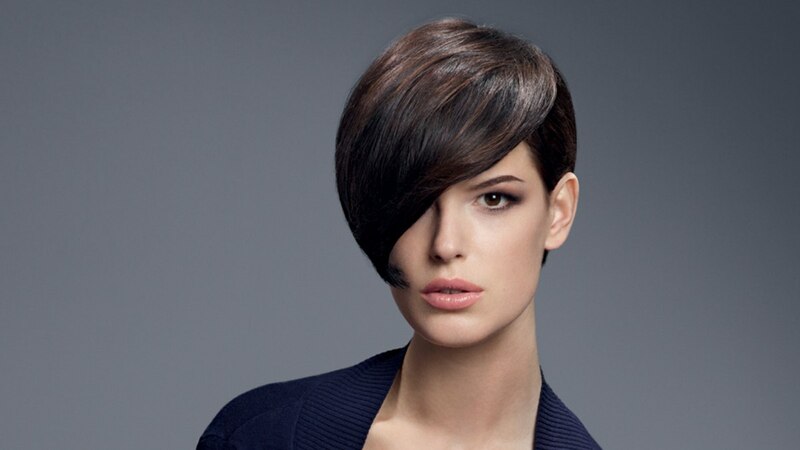 With a side fringe a sensual and very elegant statement comes to its dark brown perfection. One curve can at times be more expressive than fifty. This postmodern look can be summarized in one word: flair. Exciting geometric lines composed with artistic balance are feminine and scream out loud elegance. The sides are smoothly pulled behind the ears and the large front part sweeps over her face like a flower petal with one adoring curl at its end. The hair color is a beautiful combination of a very dark cocoa brown and a dark brown, that is just a few steps lighter than the base color to avoid any harsh contrasts but to use the color in a subtle way to accentuate the flow of the hair. Bundles of spiral curls just resonate happy moods. This ravishing look reminds of the big hairstyles that were popular in the 80s, but with much more definition and modern texture. Her layered medium long locks are just spiraling happily all around her head and not one hair was missed. 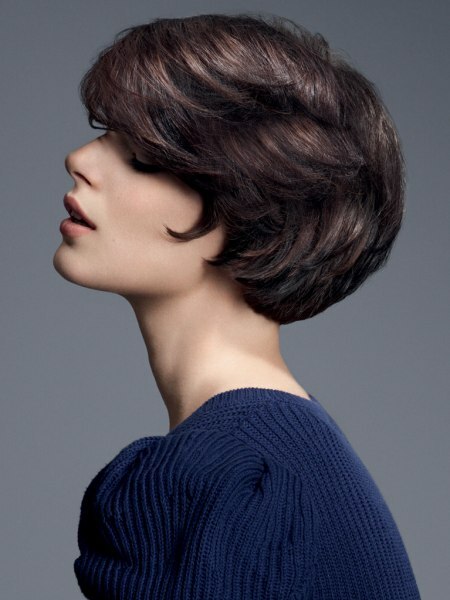 With shorter bangs a very romantic frame for her face lets her look very feminine and playful. 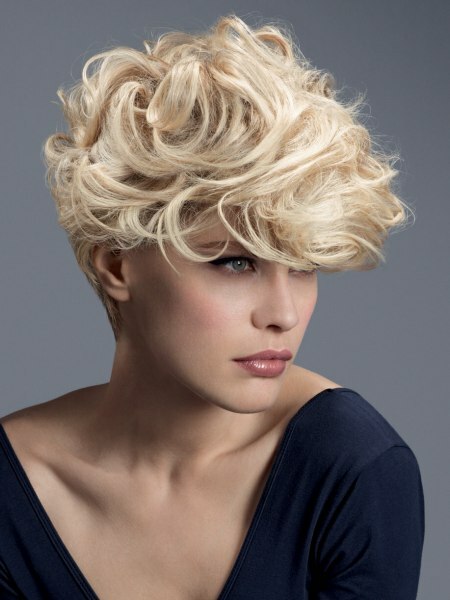 The curls have a good definition and some of them are styled to a slightly mussed and rebellious texture. A very chic but casual curl permeates the over the shoulder long hair and adds a very pretty lightness to her medium brown hair. The star of this hairstyle is however the long fringe with its very sleek nature. It almost covers her eyes and is curved gently in its tips. This is the biggest contrast in this look since the highlights are very "tone in tone", with just a few steps between the lighter and the darker hues and both coming from the same color family. Now women get to play with bow ties too! It is about time. One of the symbols of masculine elegance is combined with an ultra feminine hairstyle and the outcome is just beautiful and very unique. Her hair has been shaped to several large coils on her head with a larger one in the front as a festive quiff. This is a wonderful style for the extravagant bride or for any ball or gala event.